We all know the feeling when those post-dinner dessert cravings hit. You’re longing for a rich, captivating treat to tie the perfect finishing bow on your evening and satisfy those remaining hungry voices in your head. The perfect solution is our Keto Lava Cake! You can make these in individual sized portions so that you get the perfect amount without overindulging. The best news is that they are easy to make, healthy, and, most importantly, delicious. Most chocolate cakes are packed with gluten, excess processed sugars and carbs, but this keto chocolate cake is gluten and soy free and incorporates sugar-free chocolate chips, grass-fed butter, coconut oil and other ingredients to support your keto diet. This recipe is super easy to prep and should only take 5 minutes to assemble, then simply pop it into the oven for 25 minutes and wait for your delicious concoction to take shape. Most of the fat in almond flour is monounsaturated fat, which has been linked to lowering cholesterol. Some studies have shown consuming almonds drastically increased antioxidant levels, as well as blood flow, all while reducing blood pressure and insulin levels found within the blood [*][*]. All of those actions are key to maintaining proper cardiovascular health! MCTs are easy-to-digest and instantly used by the body for fuel. They have shown MCTs can help prevent cardiovascular disease by decreasing blood triglycerides and LDL particle size. Eggs are a high-quality source of protein and have a complete amino acid profile. They also contain zeaxanthin and lutein, which have been proven to manage cardiovascular health. Some studies concluded that consuming more lutein-rich foods were associated with better cardiometabolic health and levels of physical activity [*][*]. When most people think of dessert they think of chocolate. But for those following a ketogenic diet, the last thing you want to consume is one high in sugar. No. That’s why we created a solution so you can finally have your cake and eat it, too, without being fearful of being kicked out of ketosis! Dark chocolate, in particular, is luxurious, tantalizing, and a healthy choice to satisfy your sweet tooth. The health benefits of dark chocolate are numerous. It is packed with antioxidants, aids with heart and brain health and great for your cholesterol. The higher the cocoa content, the lower the sugar content, which seems counterintuitive but is actually true. This is especially beneficial for those suffering from Type 2 Diabetes. One study was conducted on individuals with Type 2 Diabetes. The purpose of the study was to examine the effects of high-cocoa, polyphenol-rich chocolate on lipid profiles, weight, blood pressure, glycemic control, and inflammation. The results showed a significant improvement in blood triglycerides and lowered blood pressure for those who consumed the chocolate that was higher in cocoa [*]. Baking a dessert without using sugar can be intimidating to many people. But evidence is mounting showing that excessive sugar consumption can be damaging to our health and especially corrosive on our teeth and oral hygiene. That’s where low carb sugar substitutes come into play and can be better alternatives to sugar. For this Keto Lava Cake, instead of sugar, we opted for Stevia. Besides not affecting blood sugar or contributing carbs or calories, stevia has also been shown to actually benefit blood sugar and insulin levels after a meal. It also contains compounds like apigenin and quercetin, which have been shown to reduce oxidative stress.[*]. It’s hard to imagine a more classic dessert than chocolate lava cake. The rich decadent chocolate mixed with the delicately tender cake combines for a truly delicious ending to any meal. With such a tantalizing dessert it is often challenging to find a chocolate lava cake that fits your dietary restrictions. 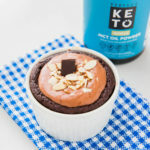 But fear not, fellow Keto lovers, we’ve got you covered with this keto chocolate lava cake. We’re certain you’ll want to add this recipe to your keto-friendly dessert list. In a medium-sized bowl, mix dry ingredients. Add mixture to two well-greased ramekins and bake for 25 minutes.